While the upcoming Pokemon Black & White will have some nifty new features, one in particular isn't so much "exciting" as it is "stunningly pointless." 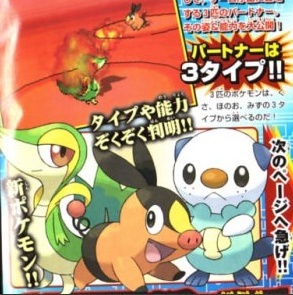 It's no secret that I'm pumped for the upcoming fifth generation of Pokemon games. Stupid-looking Water-type starter aside, the Black & White games seem to be adding features that fans of the series have wanted for some time, like in-battle animations; larger, three-dimensional towns; life bars that don't take half an hour to drain when a Pokemon suffers heavy damage - that sort of thing. If you'll be playing Pokemon Black & White on a DSi or the upcoming 3DS, however, you'll get something else: live in-game video chat over the DS' Wi-Fi connection, which is enabled once you find the "Live Caster" item in the game. This is, of course, a natural evolution of the in-game voice chat introduced in in the series' fourth generation with Diamond & Pearl, and utilizes the forward-facing camera on the DSi and 3DS. Makes perfect sense, right? But wait, it doesn't end there! While the Wi-Fi video chat is only limited to two people at a time, Pokemon Black & White will support four-way video chat over the DS' local wireless network. Which, uh, requires you to be in fairly close proximity to the people you're chatting with. So this is effectively a video chat that can only be used when all four people are in the same room together. Not all the features are this vestigial, thankfully - the game will also have something called "Pass By" mode. While the exact details of the mode have yet to be revealed, it seems that it will allow dormant DSes to connect with each other automatically. So, if you have your DSi in your backpack and walk past someone else with the game, the two of you will connect without any input and ... I don't know, you'll get something - exactly what you'll get remains to be seen. It sounds like the Pokewalker from HeartGold & SoulSilver, but part of the fun of the Pokewalker was the human interaction. Stunningly useless four-person video chat aside, Pokemon Black & White look to be shaping up to be perfect examples of how the series keeps adding new features - or should I say "evolving" - while retaining the same Pokemon core that we all know and love. I'm still going with Firepig as my starter, though. Who's with me?